Overview - This spectacular Technicolor epic, directed by Zoltán Korda, is considered the finest of the many adaptations of A.E.W. Mason’s classic 1902 adventure novel about the British Empire’s exploits in Africa, and a crowning achievement of Alexander Korda’s legendary production company, London Films. Set at the end of the nineteenth century, The Four Feathers follows the travails of a young officer (John Clements) accused of cowardice after he resigns his post on the eve of a major deployment to Khartoum; he must fight to redeem himself in the eyes of his fellow officers (including Ralph Richardson) and fiancée (June Duprez). Featuring music by Miklós Rózsa and Oscar-nominated cinematography by Georges Périnal, The Four Feathers is a thrilling, thunderous epic. I'm not exactly sure where bravery comes from, and it seems like courage can be fueled by many things. Some are urged toward valor by a great sense of honor, duty, and justice. Others are compelled to selfless acts by great love and compassion. Indeed, various emotions and principles are capable of stirring up the hero within us all, but in Zoltan Korda's 1939 classic, 'The Four Feathers,' it is, of all of things, cowardice itself that drives a man toward gallantry. Faced with the shameful realities of his own fears and weaknesses, a reluctant soldier chooses a new path, leading the way toward one of cinema's true, pioneering epics. A handsomely shot, elegantly staged, and richly layered work, 'The Four Feathers' stands the test of time and fully earns its classic status. One of seven adaptations of the A.E.W. Mason novel produced over the years, the story centers on Harry Faversham (John Clements) a young British soldier who much prefers literature and poetry to battle and bloodshed. After marrying the beautiful Ethne Burroughs (June Deprez) he decides to resign from his post right before his regiment is deployed to fight the enemy in Sudan. Branded a coward by his former friends, including Captain John Durrance (Ralph Richardson), Harry begins to question his motives and fears that they might be right. When even Ethne seems unable to defend her husband's brash decision, Harry decides that he must venture off toward battle on his own. Determined to prove his worth to his wife and fellow soldiers, he embarks on a dangerous journey that sets off an epic and sweeping adventure through barren wastelands and exotic locales. Though the script diverges from the source material in sometimes significant ways, this version of the story is widely regarded as the strongest. Fueled by a deep thematic backbone, the plot offers insight, emotion, and excitement. Watching Harry's transformation from coward to hero is moving, and the elaborate lengths he goes to in order to redeem himself are admirable. Though the setting and plot are epic, his personal story is easy to connect with, and as he proves his courage and resolve to himself, he also does so to the actual audience, getting us to root for him and his mission. One scene features a character calling Harry brave for the first time, and the joyous smile that fills the man's face speaks volumes, effectively saying all that needs to be said about his motivations and goals. When the rogue soldier eventually meets up with his regiment, a clever and important twist is revealed, adding a level of irony and intrigue to the story that helps to complicate the plot in interesting and dramatic ways. A love triangle is also formed, and while Captain Durrance could have easily become a one dimensional foil to Faversham, the script and Rich Richardson's performance take a more multifaceted and even sympathetic approach. There are certainly aspects of the plot that are unrealistic and outdated, but the core of the narrative remains compelling, and John Clements does a fine job of carrying the picture. A classic epic in every sense of the word, Zoltan Korda fills the screen with Technicolor grandeur. Wide, elegant shots of endless desert and complicated battle sequences filled with hundreds of extras reveal a time when filmmakers couldn't rely on computers and digital wizardry to create a sense of scope. This is raw, extravagant moviemaking at its best. Intricate costumes and production design are also common place, adding small details to the proceedings, and elaborate studio sets serve as worthy alternatives to real settings when necessary. While Korda's style is mostly in service of the story and an overall air of majesty, the director does utilize composition and editing to sometimes meaningful effect. Despite the beautiful excess, there are times when the battles overpower the characters, and we momentarily lose focus on Harry causing a slight disconnect. Thankfully, though, Korda mostly knows when to hone his style back in, and does a good job of telling an emotional and personal story against a large backdrop. A huge influence on all subsequent epics, especially the works of David Lean, the film is a classically crafted exercise in early silver screen spectacle. 'The Four Feathers' weaves an exciting and thoughtful tale of bravery and redemption. Through Harry Faversham's journey we are shown what true courage really is. A highly influential piece of filmmaking, Korda's classic still holds its own today and its themes remain universal. The spark toward heroism can come from many places, and only when confronted with our own shortcomings and doubts, can we truly choose a valiant path. This is a film about a man who thought he was a coward, but he was wrong. Very wrong. 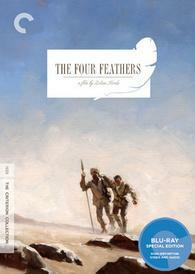 Criterion presents 'The Four Feathers' on a BD-50 disc housed in a standard case with spine number 583. A comparatively slim (by Criterion standards) insert is included in the package with an essay by film critic Michael Sragow. 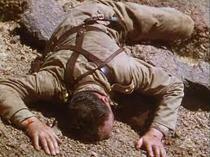 The movie is provided with a 1080p/AVC MPEG-4 transfer in the 1.37:1 aspect ratio. Filled with epic scenery and beautiful Technicolor photography, the film looks good but does suffer from some damage and a few anomalies. The print is in decent shape but there are periodic specks, vertical lines, and scratches throughout. While definitely noticeable they are never a major detriment. A moderate level of grain is visible throughout, but looks a bit harsh at times. Detail is good, and the intricate sets, costumes, and locations all look lovely. Unfortunately, there are some frequent pulsing, color fluctuations and there are times when the picture looks a little faded with slightly low contrast. With that said, the Technicolor palette does shine through nicely in many sequences, with beautiful hues, most notably bold reds. Black levels are solid and consistent. 'The Four Feathers' doesn't appear to have gone through as thorough a restoration as some other Criterion titles, but this transfer still looks rather strong. Despite some damage and color fluctuations, the movie's epic cinematography is preserved nicely. The audio is presented in an uncompressed English Mono PCM track with optional English subtitles. While there are inherent limitations to a film of this age, the track sounds just fine. Dialogue is clean but has a thin quality that is characteristic of movies of this time period. Fidelity within the single channel is average, but given the film's age, I was actually impressed at times with the level of distinction between effects. One battle sequence features gunshots, trumpets, shouting, and cackling fire all at once, and the mix does a solid job of presenting all the distinct sounds without muddling the various effects together. With that said, there is some slight distortion in the high and low ends of frequencies and some background hissing is periodically audible. Bass activity is of course subdued, but balance between speech, score, and effects is good. The audio is definitely a product of its time, but considering the movie's age, the mix is solid. This is about as good as the film can sound, and the track serves the story and visuals well. Criterion has put together a comparatively slim but still worthwhile collection of supplements, with a commentary, interview, and vintage featurette. All of the extras are provided in 1080p with English Dolby Digital mono sound and no subtitle options. Audio Commentary by Film Historian Charles Drazin - Drazin provides a thorough discussion of the film and its production. Lots of details are given on the differences between the movie and the original novel, as well as insights into the Korda family, shooting locations, actual history that inspired the story, stylistic techniques, comparisons to other adaptations, and an analysis of the movie's themes. Packed with lots of varied information on a range of topics, this is a very worthwhile track. David Korda (HD, 23 min) - Recorded in 2011, this is an interview with Zoltan Korda's eldest son, David. David traces his father's early life and his path toward filmmaking. He provides several stories about the director's experiences in the industry and his personal life, including his relationship with his brothers, rounding out a welcomed portrait of the man. A Day at Denham (HD, 10 min) - This is a vintage promotional piece from 1939 that provides a tour of the Korda family's London Film Productions. We get a look at workers and extras arriving at the studio, details on different departments, and behind-the-scenes footage of a few productions including a scene from 'The Four Feathers.' Though a pretty standard fluff piece, its vintage aspect makes for an interesting watch. Theatrical Trailer (HD, 3 min) - The film's trailer is presented in 1080p. 'The Four Feathers' is a pioneering classic of epic cinema that still manages to entertain and enlighten with its sweeping cinematography, grand adventure, and strong themes of redemption and courage. The video and audio presentations show definite signs of age, but still manage to shine nicely on Blu-ray. Though supplements are a little slim, the commentary is informative. This is a relatively light disc from Criterion but still gets an easy recommendation.